Here's the AAC's all-conference and all-rookie teams. I thought Shonn Miller might make second team instead of Daniel Hamilton, but despite Hamilton's struggles this season, he's still among the league's top rebounders and assist men. And he's got more name recognition. Also thought Jalen Adams might make all-rookie, but this isn't a huge crime, either. If you want to go by stats, he doesn't compare to the five who made it -- or, you could argue, with UCF's Tacko Fall, the league's top shot-blocker who's become a bit of an offensive force lately. The league's defensive player of the year, Sixth Man Award, most improved player and Sportsmanship Award winners will be announced on Wednesday. On Thursday, at a 12:30 p.m. luncheon, the league's player of the year, coach of the year, rookie of the year and scholar-athlete of the year will be announced. UConn doesn't figure to reap too many (if any) of these awards. Maybe Rodney Purvis for Sixth Man? 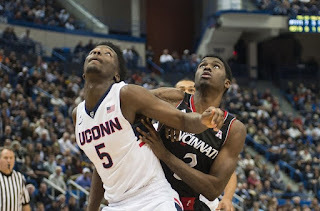 Maybe Amida Brimah for DPOY (did he play enough? I don't think so). One thing is certain: if SMU's Nic Moore repeats as AAC player of the year, he won't be on-hand to accept his award. Seems Moore has booked a cruise this week with his girlfriend. Guess you can do that when your team has a postseason ban. The talent level of the American is really down this year. Hamilton had good rebounding and assist stats but all in all, he had a really extended cold streak this year. He would not make second team all conference in any of the nations top conferences. Further evidence of the talent shortage in the american conference is Rodney Purvis being considered for 6th man of the year. As a former high school all-american, 4 years later, Purvis is a bust and extraordinarily inconsistent.